Wild Mushroom Frittatas, Thyme for Cooking easy starter or snack. 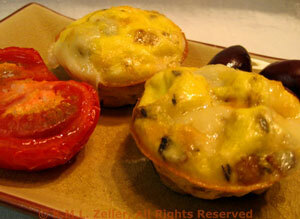 You can use wild, cremini, or regular button mushrooms for the mini frittatas. They are good when made ahead and served at room temperature for a picnic, but tonight they'll be served warm with a roasted tomato to garnish. Place in a small baking dish, drizzle with oil and bake for 20 minutes. Clean mushrooms, discard stems and chop caps. In medium nonstick skillet sauté mushrooms, shallots and garlic in oil over medium-high heat until golden, 7 - 10 minutes. Remove from heat. Butter or spray a nonstick muffin (tartlet) pan - one that holds 6. If you're using silicone you don't need to. Divide mushrooms evenly between the cups. Slice the cheese then cut into smaller pieces. Divide evenly and place on top of mushrooms. Crack the eggs into a large bowl, add thyme and whisk well. Using a ladle or spoon divide mixture evenly between 6 muffin cups, spooning over mushrooms. Bake at 400F (200C) for 12 - 15 minutes or until golden and set. Serve with a tomato half and a garnish of olives, warm or at room temperature.